Starting a new fitness journey can be a struggle at times. You may doubt yourself when you don’t achieve a goal or you may want to give up when your temptations overcome your healthy choices. 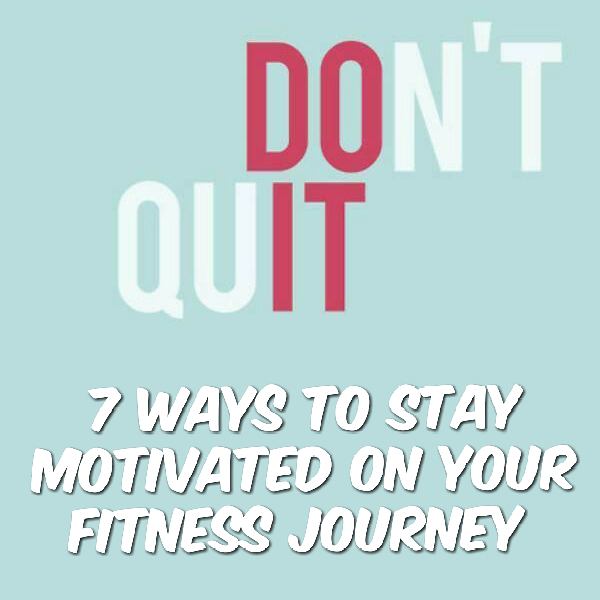 Whatever the case may be, here are 7 ways I stay motivated on my journey. When you first start your journey it is very important to take pictures of yourself. No one really likes taking the before pictures but taking progress pictures is a helpful way to see the hard work you have done. Of course you may not want to take them because you don’t like the body you see, but I guarantee that a month from the time you took the pictures you will see your progress. Not only will it make you happy but it will give you a reminder that even if you don’t see the small changes from looking in the mirror, looking at your before and after pictures will push you to continue. Everyone has an ultimate goal weight as a long term goal but setting small short term goals helps keep you motivated throughout your journey. You don’t want to put too much pressure on you in the beginning of your journey because it will be easier for you to get discouraged. Set small goals for the week or month until you reach your long term weight goal. For example, a good short term goal is increasing the length of time you run in a certain amount of time. (Ex. run one min straight and rest for 30 seconds) or increasing the amount of days you exercise. Sometimes you might not have enough discipline to exercise or eat correctly and going to the gym alone is sometimes a nerve racking experience. It’s sometimes intimidating to see other gym members that are more fit than you. I would suggest having a reliable person that has some of the same goals as you that can become your workout partner. Having a workout partner/accountability partner helps keep you from eating bad and keeps each other in check with goals through the process. Looking at other people’s transformation is motivating because it shows you that if they can transform their body then you can do it too. Looking at another persons process of how they are going about their journey not only gives you tips on getting started but motivates you to improve your lifestyle like they did. Looking on Instagram and searching Transformation Tuesday is a great start to finding motivation. In order to stay motivated you have to take your journey one day at a time. If you put too much pressure on yourself you will easily get discouraged. Don’t be too hard on yourself, remember that you are your own worst critic. Lighten up and stay positive through the process. Everyone’s body is different and what one weight goal for one might not be for you or what one diet plan for one might not be for you as well. It is good to receive advice but sometimes you have to alter the advice to fit your own needs. Don’t compare yourself in a way that puts you down in the end. Everyone reaches their goals at their own time and when it comes to exercising, downing yourself because another person can do a workout better than you isn’t the way to go. Give yourself time and you will be there soon. Every milestone is a victory, big or small. You might lose three pounds or five pounds and guess what? You should be happier than ever! You might have went a whole week with drinking only water and guess what? You should congratulate yourself. Whatever goal you put on yourself and you reach be happy and push harder. Don’t let small victories remain small, any change is good because you were better than what you were yesterday. Those “small victories” add to a bigger picture, A BETTER YOU. Want to know how I’ve done it so far? Take a look at my previous post here. I’ve been trying to find the balance with my health journey because I just accomplished my second month of exercising and adjusting my eating habits and I don’t see much of a change but I know I have to be patient. I had a physical done earlier this month where my doctor commended me on making changes and being active, I also celebrated the fact that I am not diabetic like I thought I might be. I have lost one pound since my physical and I was ecstatic! I can’t remember the last time I lost one pound. I have been feeling a little more confident taking pictures of myself but I need to take one just for my personal view of my waist area to look back on. I have been making small fitness goals and try to set and complete one for each month. The first one was to just be active and I accomplished that by getting a gym membership. The second one for this month was to research meal preps, healthier snacks and alternatives. When I am feeling low and discouraged, I look at fit blogs and Instagram accounts of people who are on the same path as me. The ones who are trying to be healthier without having procedures done, advertising teas, waist trainers, cleansing, etc. I just want to follow people who are on the same path as me with eating better and exercising regularly. Thanks for sharing this post, I needed it!